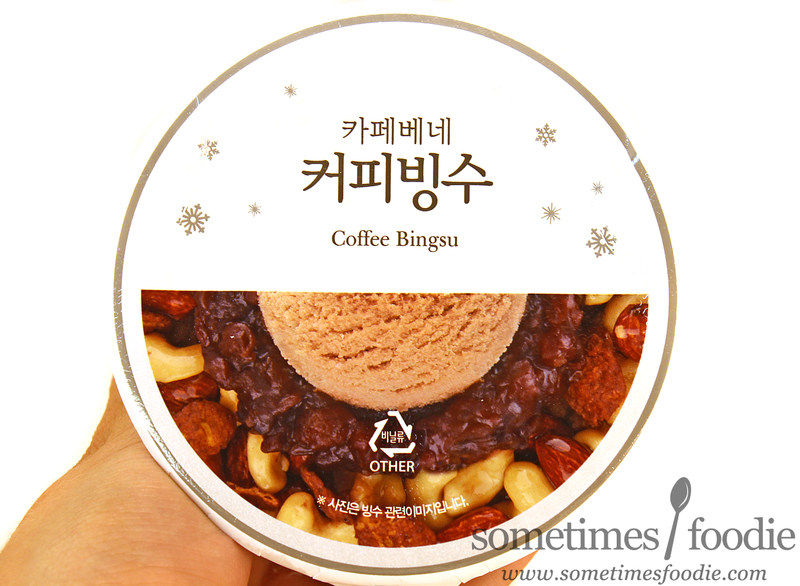 Even though I'm not a big coffee drinker, I do like a little coffee ice cream once and a while, so why not try it in Bingsu form? This container is several months old. I intended to review it right away, but it got wedged behind a few other things in my freezer and I completely forgot about it until I bought that strawberry version in New York. Now that I'm home, busting through my stash like a food blogging pro, it's time to finally try this frozen treat! The packaging is the same as the other two flavors I've previously reviewed. It's plastic, kind of ovate-shaped at the bottom, and it comes with a handy little spoon hidden inside the lid. 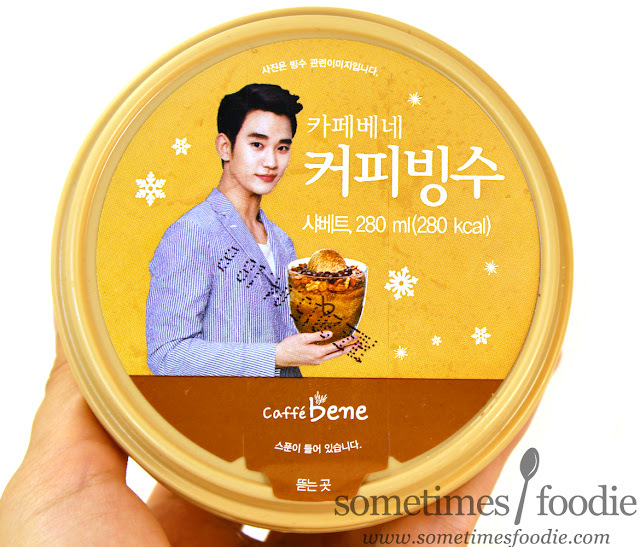 Cute, functional, and Kim Soo-hyun has returned! Hooray! MIXED NUTS? Okay, I wasn't really expecting that. I'm not a fan of nuts in my ice cream, let alone my coffee. This seems like a really odd choice, but you know what? Maybe there won't be nuts inside. After all, these illustrations always show a flavored ice cream when the contents are just vanilla with a layer of flavoring on top. Maybe its wrong. It's not wrong. Okay, not too thrilled about the nutty mix-ins. 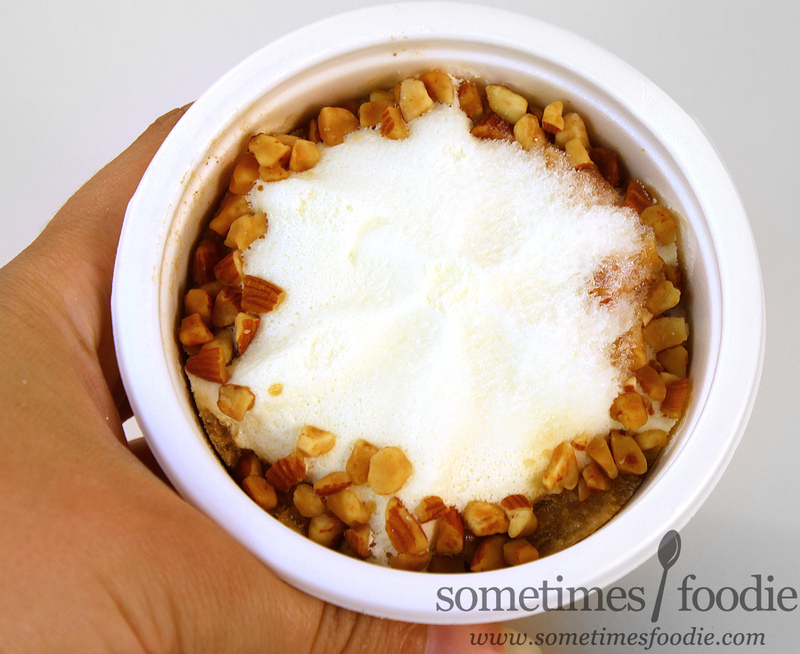 It looks like we have vanilla ice cream, like I expected, surrounded by a layer of...nuts. Where's the coffee? 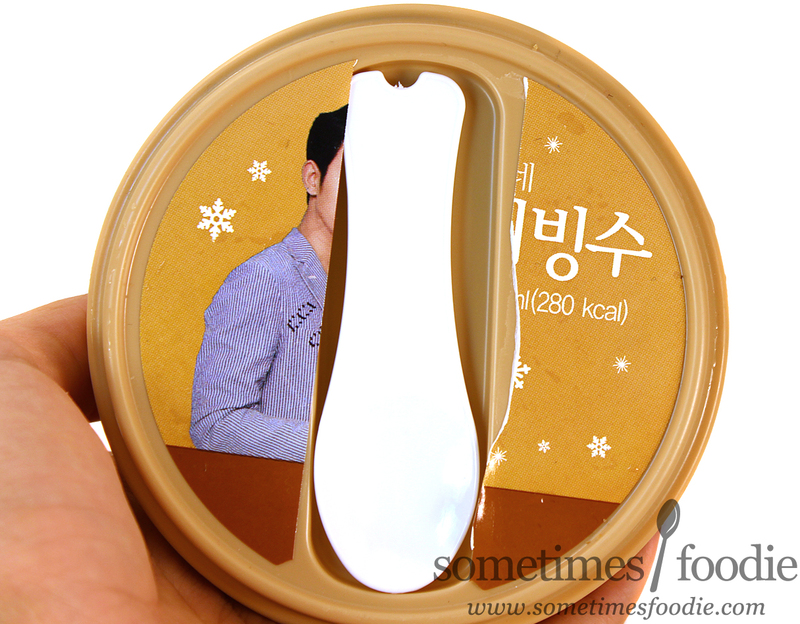 I see a little something peeking out on the edge, better grab my spoon to investigate. I dug in, and found an icy coffee layer under the nuts. (That's what she said?) I think the shaved ice is either made with frozen coffee, or it has a coffee syrup layered on top, because this mixture is surprisingly bold! 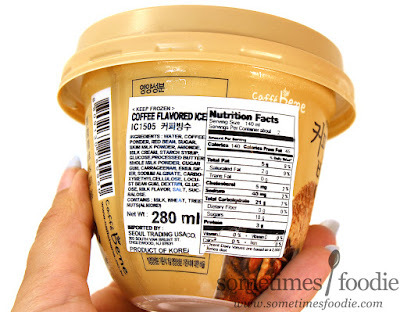 It's got some pretty concentrated coffee flavoring that reminds me of that bottled coffee drink I bought back when Sometimes Foodie was only on Tumblr! It's very sweet, but still strongly flavored, and not all that creamy, which is why it pairs so nicely with the ice cream portion of this cup, and the red beans work pretty nicely with this icy coffee combo as well, but the nuts? They feel really out of place and I find myself picking around them. I liked this flavor a lot, but I feel like this is something I can recreate at home without the nuts. I can take crushed ice, that coffee drink I mentioned earlier, red bean and vanilla ice cream and make my own with blackjack and hookers. Most of that stuff is already in my freezer/pantry! If you're a fan of the Coffee Nut m&m's, you might really enjoy this as-is, but I don't think I would buy it again. I rather DIY my own and customize it to my tastes.